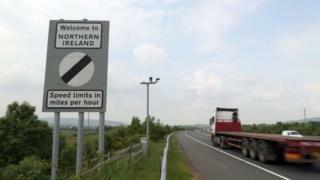 Image caption The EU said it would expect the UK to "live up to its commitments to avoiding a hard border"
The EU and Republic of Ireland are "intensifying" discussions about the Irish border in the event of a no-deal Brexit, senior EU officials have said. The EU said it would expect the UK to "live up to its commitments to avoiding a hard border". The prime minister has said Northern Ireland is unable to prepare properly for a no-deal Brexit. Speaking in the House of Commons on Monday, Theresa May said she had wanted to deliver Brexit on 29 March. "But, I'm conscious of my duties as prime minister to all parts of our United Kingdom and of the damage to that union leaving without a deal could do, when one part of it is without devolved government and unable therefore to prepare properly," she said. Former Northern Ireland Secretary Owen Paterson said he was surprised to learn that Northern Ireland had not been able to prepare properly. The prime minister said it "would not have been appropriate" for no-deal to go ahead on 29 March because "the Northern Ireland civil service do not have the powers to take necessary decisions in the event of no deal". Mrs May told MPs a no-deal Brexit would require some "direct application of powers" from Westminster to Northern Ireland. The DUP and Mrs May talked by phone earlier on Monday. Mrs May updated the DUP on her latest conversations with Conservative Brexiteers which took place at the prime minister's country residence, Chequers, over the weekend. The DUP - whose support for Mrs May's deal will be crucial if the government is to win the vote - said its position had not changed after the phone conversation. "The controls will have to be done where they belong but that doesn't mean we would want to see visible infrastructure at the border," an EU official said. An EU spokesperson added that if a no-deal Brexit happened "both sides would need to take unilateral and temporary measures to protect legitimate trade, consumers and public health". "The commission is ready to make additional resources available to Ireland (technical and financial) to address any additional challenges," the spokesperson said. They added that "in all scenarios, the Good Friday Agreement will continue to apply". Earlier, International Trade Secretary Liam Fox said he was in "regular contact" with the DUP. He said the party understood the weight of the decisions it was having to take - especially with regards to the future of the union. "They understand more than most the complexities of the Irish border issue," he said. "But there has been a clear commitment to leave the EU, all MPs have to weigh up those elements. "For me it's a clear choice, we voted to leave, we have to leave, some voters are frustrated we haven't left already." Meanwhile, Garda Commissioner Drew Harris has said "zero work" has been done around the implementation of a hard border.